Davenport, Nebraska offers contemporary down-home country living. Come join us! We offer solid community values, economic opportunity and affordable living. Houses rent for $150-$250 a month, and the average cost of buying a house is $25,000-$30,000. 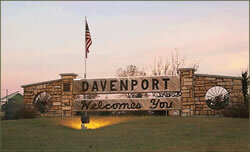 Davenport is an affordable place to live, work and have a business. For details on our great little town, we invite you to look over our pages and links. Come to our town. You are welcome here! Copyright © 1999 Nebraska Public Power District. All rights reserved.